Our English speaking tour guide will hold a welcome sign to meet you at Hangzhou Airport or train station, then transferred to the hotel. The rest of the day is on your own to explore Hangzhou. Visit the the Lingyin Temple and the Six Harmony Pagoda, cruise on West Lake. Lingyin Temple, commonly translated as "Temple of the Soul's Retreat" is one of the largest and wealthiest temples in China. It was originally founded in 326 AD, but has been rebuilt no less than sixteen times since then. 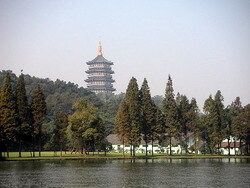 West Lake is the symbol of Hangzhou. Marco Polo called Hangzhou the most enchanting city in all the world. Hills embrace the lake on three sides; the city proper lies to the east. 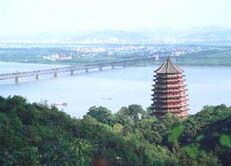 Ancient Chinese people praised the West Lake area as a land of intoxicating beauty. [ Optional ] Impression West Lake: a unique metropolitan outdoor performance in Hangzhou. The stage is set on the wavy and mellow West Lake, around Su Causeway, Curved Yard and Lotus Pools. When the night falls, colored lighting shrouds the lake, with hills and water as its backdrop. The show tells you "The Legend of the White Snake", set in the Southern Song Dynasty about 800 years ago. 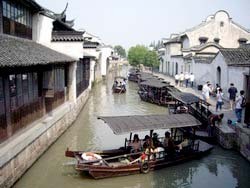 Today we will drive to Wuzhen Town, to visit the Wuzhen Water Village (about 50 minutes driving). After finishing our visiting, transferred back to Hangzhou. Wuzhen is a small town with the history of 1200 years, with its black tiled, tung oil painted timber framework houses, that contrast sharply with its white walls and gray flagging, brings to mind a Chinese ink and wash painting. [ Optional ] Water towns in China: In the southern part of the Yangtze River, there scatters a number of towns associated with fascinating sceneries-limpid rivers, smart bridges, quaint architectural groups etc. Yummy local delicacy should be another magnet for you. You could have a chance to taste all the local delicious snacks and main courses as well. [ Optional ] Dragon Well Tea Village: Dragon Well Tea is famous for its unique fragrance and flavor, distinguished leaf shape and green color. Dragon Tea and Tiger Spring match each other so well that they are rated together as the two superb specialties in Hangzhou. Visiting the Dragon Well and Sipping Tea there was a visual and oral pleasure no one could afford to miss during those years.